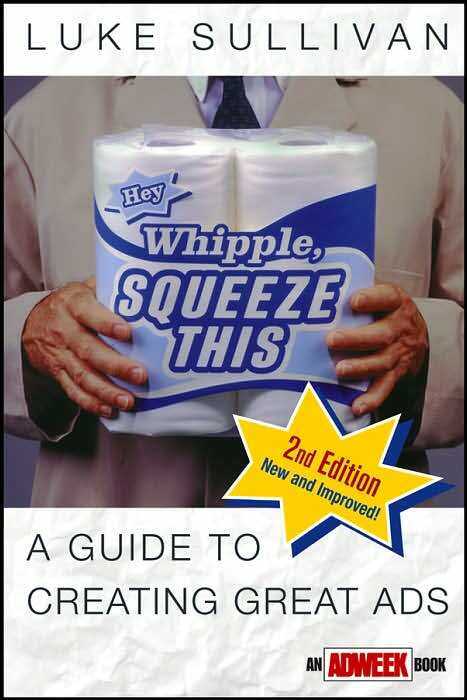 When I was just a little copywriter tad pole, someone recommended I read Hey Whipple, Squeeze this. A year or two passed and I finally bought it. But it stayed on the shelf for another few months before I finally read it and realised what a true douchetard I was for taking so long. I'd like to blame the creative who reco'd the book, seeing that "Hey, read this." isn't exactly a compelling call to action, but I take full responsibility here - imagine how great I'd have been had I read this book two years earlier?? This is one of the best how to make ads books out there and should be required reading for every creative wannabe. If you haven't read it yet, hopefully my endorsement and/or the review get you to put it in your cart too. I was recently at an agency talking to some young copywriters about the business of making advertising with words, when I noticed this edition of Luke Sullivan’s great book sitting on one of their desks. The copywriter told me that one of the senior copywriters had told him to read it, and she had been given it by their CD a few years back. Or said another way, things are in good hands in this agency’s copyland. If you’re not familiar with “Hey Whipple, Squeeze This” – and you should be – then let’s start at the beginning with the author. Luke Sullivan honed his copywriter and CD skills at some of the most creative shops of the last thirty years, agencies like Fallon McElligot, the Martin Agency and GSD&M. Now he’s the Chairman of the Advertising Department at the Savannah College of Art & Design. So, like that other ad man who laid out some important how-to’s (and how not to’s) earlier in the last century, Sullivan knows what he’s talking about. And speaking of David Ogilvy, it is difficult to talk about “Whipple” without at least referencing “Ogilvy on Advertising” (which we reviewed here). Because until Sullivan’s book, Ogilvy’s was the guide to creating ads. Agree with it, disagree with it or fling it out the window in long form copy frustration, it, like “Confessions of an Advertising Man” twenty years before it (reviewed here) at least had the cojones to plant a flag in the ground about this business. It at least said “This I believe. You believe differently? Good, prove that your way is better.” And until “Whipple”, no one really had – at least, not as well. Sullivan’s book covers just about every aspect of advertising, and not just the ones you’d expect. Of course there are chapters on TV (Chapter 5, “In the Future, Everyone Will be Famous for 30 Seconds”) and radio (Chapter 6, “Radio is Hell, but it’s a Dry Heat”), and the book is packed with some of the greatest print ads of the last 60 years. But there’s also a brief history of advertising that will have you laughing out loud and saying “oh, THAT’s why it’s like that…”. Plus a chapter on how to protect your work (Chapter 9 “Pecked to Death by Ducks”), one on how to get into the business you’ve been reading about for the past nine chapters (Chapter 10, “A Good Book or a Crowbar”) and why this is still a business you should want to get into, in spite of everything you’ve read or been told to the contrary (Chapter 11, “Making Shoes vs. Making Shoe Commercials”). But what really makes this such a great book is not its surprising comprehensiveness, nor that it offers updated thinking about how to make ads. Nor is it his elegant evisceration of the Charmin advertising of the 1960s and 70s. No, what makes this worth running out and buying is that it really captures the flavor of what it feels like to work in a great creative department. It has the funny, snarky, cynicism that runs rampant in the best agencies, tempered with the smartness, insight and context that are the hallmarks of the best creatives and shops. Or said another way, if you’re in advertising and you find this book tedious, boring and incomprehensible, then you really should re-consider your career choice because you will probably never be happy making ads. Now, to be clear, this review addresses the second edition of “Hey Whipple, Squeeze This” which came out in 2003; since then two subsequent editions have been published, the most recent in 2012 which purports to address social media and other emerging platforms. It may, and I would like to assume that it does so with the wit, creativity and brilliance that the rest of the book does. But I could be wrong, and if advertising – and Luke Sullivan, for that matter – has taught me nothing it has at least taught me to take nothing for granted. But whatever edition, here’s the thing that makes this book valuable to you: Read it and not only will you sound like you know what you’re talking about, there’s a better than average chance you actually will know what you’re talking about. Better yet, you may even know why the difference is so damn important. And that’s something of which Mr. O would definitely approve. Hey Whipple, Squeeze This by Luke Sullivan was published by Adweek/Wiley on 04/04/03 – order it from Amazon here or from Barnes & Noble here - or pick it up at your local bookseller ( find one here).